The wings of flight in an age of adventure…and much more. Lake Michigan is the largest lake completely within the United States. The Great Lakes are the major geographical feature of the Midwest, and are in turn an important part of the Midwest’s being America’s Heartland, both geographical and economic. The scene of much of the country’s industrial development from the days of the Northwest Ordinance (which predated the Constitution of 1787) through the nineteenth and twentieth centuries, the region wealth-creating abilities were a driving force behind the success of the Warringtons and others. Winter Quarters: the Civil War was fought far from Lake Michigan’s shores, but many of her sons would serve in the Union army. 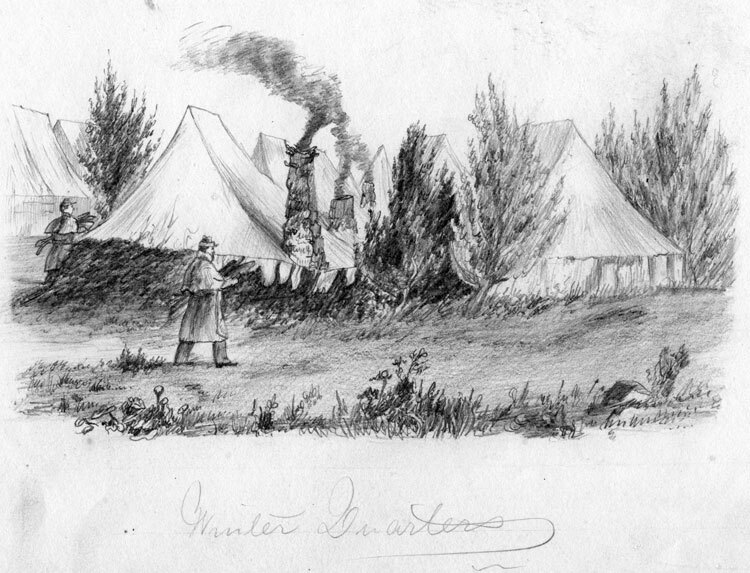 A sketch by George’s brother William H. of winter quarters during that conflict. 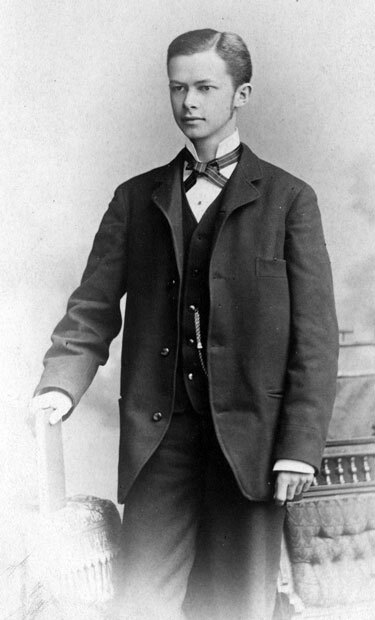 Henry Warrington came to Chicago in 1842; ten years later, he started the Vulcan Iron Works. All the while he raised his family. Henry had four sons to reach adulthood. Below is his son Samuel Warrington, who died at age 22, a reminder that the steed of mortality galloped more quickly then than now. 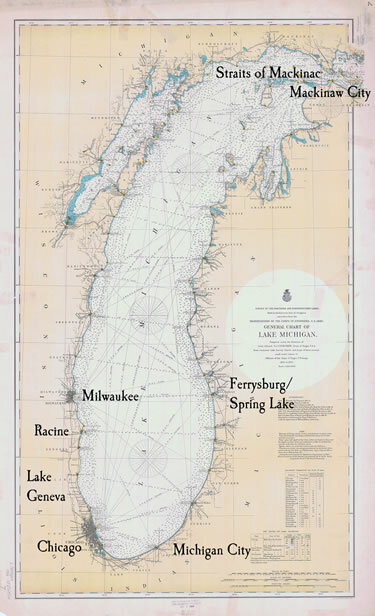 A 1900 chart of Lake Michigan. We’ve highlighted some of the places that are especially important to our narrative. At the bottom of the lake is Chicago, the metropolis whose explosive growth was so important to the Warrington family. 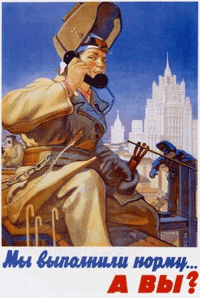 In 1890 the city had just passed a million inhabitants; at one point it was the fifth largest city in the world. 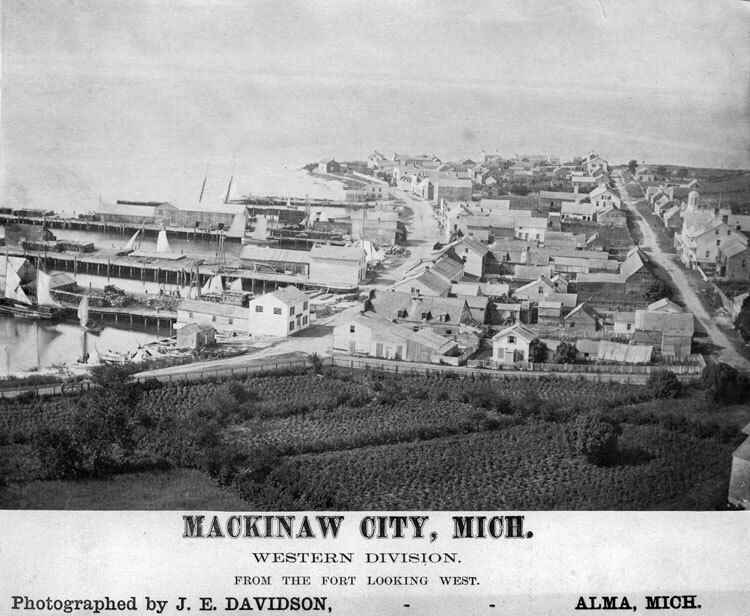 Mackinaw City during the 1860’s. At the opposite end of Lake Michigan, every ship entering or leaving the lake had to pass by the city and through the Straits of Mackinac. The Straits beckoned Chicago yachtsmen for a lake-long race, but it wasn’t until 1898 that the Chicago Yacht Club first organised such a race. 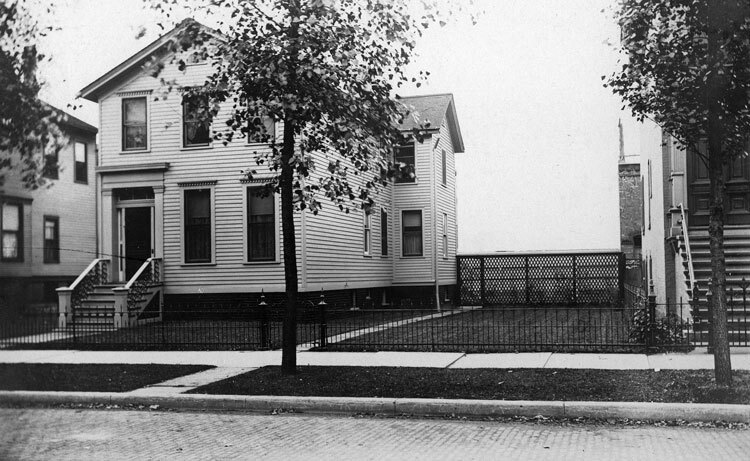 George Warrington’s House in Chicago. 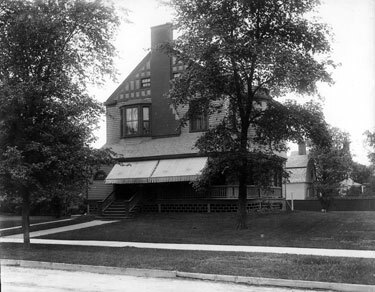 The 1900 Census listed his house at 1706 Kenmore Avenue (now 4303 Kenmore Avenue,) in the Buena Park area. 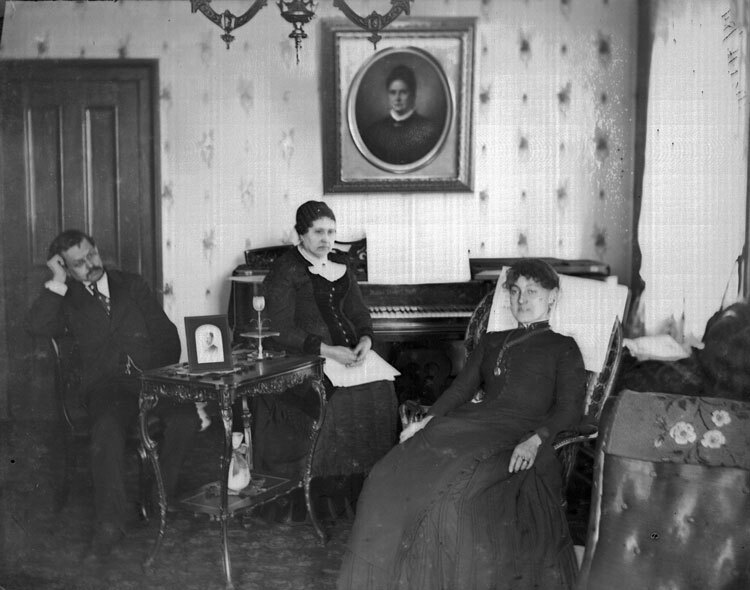 There were four occupants of the house: George, his wife Minnie, their ten-year old son Chester, and the servant Julia Carlson. One thing that is striking about these photographs is how “suburban” they look; the American ideal of what a nice neighbourhood looks like hasn’t changed that much, even though places like Chicago have urbanised to the point where such neighbourhoods are unattainable to the vast majority of people. 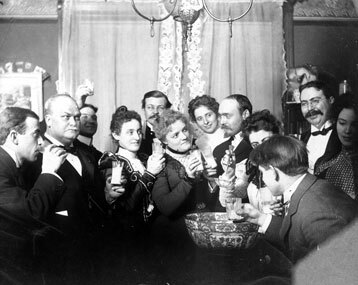 Partying, Victorian style. Looks more like a family gathering. 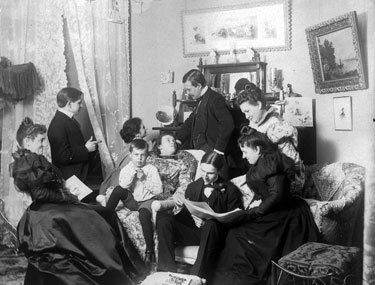 Partying, Victorian style. It has the look of a New Year’s celebration. 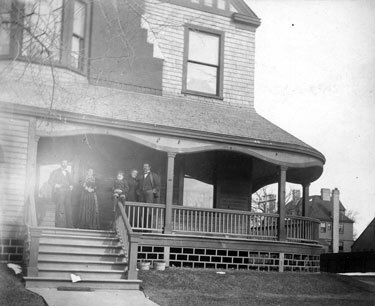 At home in Chicago: from right to left, George, his mother Isabella MacArthur Warrington, and Minnie. All of them are under the watchful gaze of Isabella’s magnificent Victorian portrait. Scanned directly from the glass negative. The house at 127 (later 1840) Park Avenue, Chicago, where Henry Warrington raised his family. This is a photo dated August 1904. Both Henry and his wife Isabella died the year the photograph was made, leaving William H. the only family member in the house. The house at 127 (later 1840) Park Avenue, Chicago, where Henry Warrington raised his family. 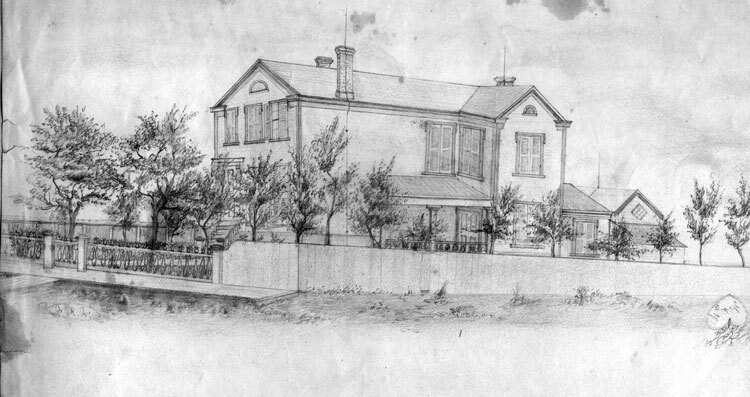 This is a sketch of the house by William H. Warrington dated around 1863-4. Click here for more of William H. Warrington’s artwork. 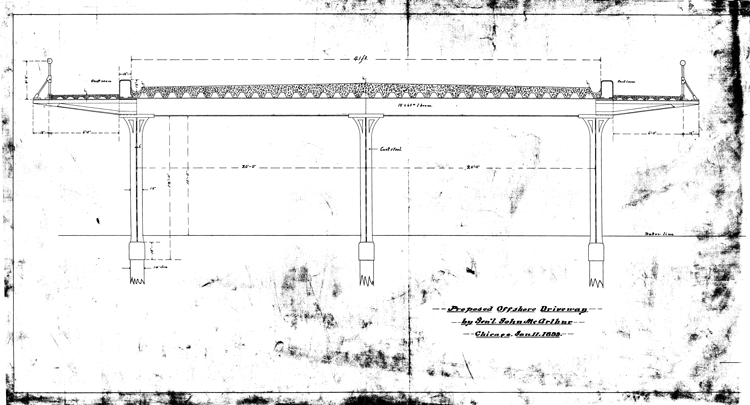 He designed things too: a proposed offshore driveway, dated 11 January 1899. 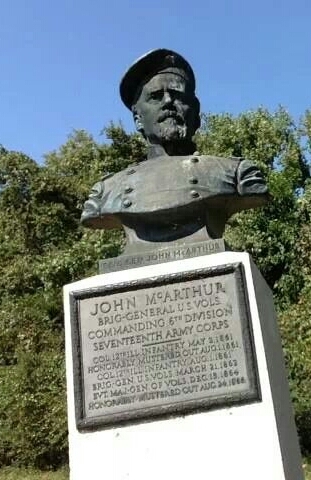 A monument to Gen. McArthur at Vicksburg, MS.
One of the more illustrious officers to serve in “Mr. Lincoln’s Army” was Brevet Major General John McArthur, U.S. Volunteers. He was Isabella’s brother and George and William H.’s uncle. Mustered out 24 August 1865. Before the war he operated the Excelsior Iron Works. After the war he was Chicago’s Public Works Commissioner during the 1871 Great Fire. He died 15 May 1906. Well, most of us are having a good time: George Warrington (top) and friends stop for a group photo at the Civil War monument to the Union at Washington Park in Michigan City, Indiana. Michigan City was and is a convenient holiday destination from Chicago. Since many in the party are in their boating uniforms, I suspect they arrived by one or more of their yachts. The monument was donated to the city in 1893, so it was fairly new when this photo was taken. At the very bottom was Chester, who wasn’t quite as enthusiastic about the adventure as the rest of the party. In an era when the idea was for children to be seen and not heard, Chet broke the mould and had quite an attitude, one which was indulged by his mother, who is sitting behind him. 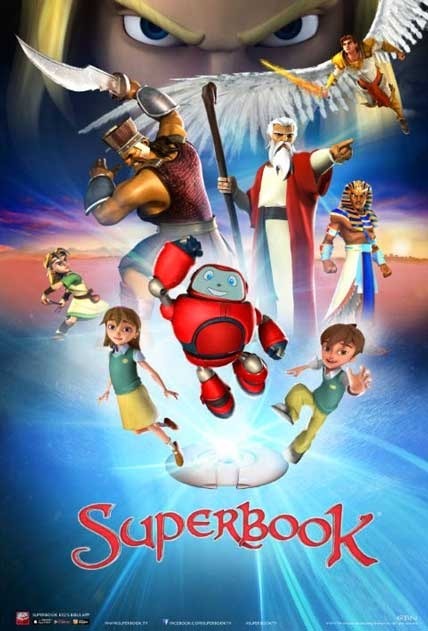 This website is dedicated to the memory of Dorothy W. Grove, Chet's daughter and my aunt, and Kennon G. Freese, her daughter and my dear cousin, both of whom went to be with the Lord in 2003. ©2004-2019 Don C. Warrington. All Rights Reserved. Use subject to the terms and conditions of the website.